There're so many affordable good lipsticks on the market and I am so excited to share with you few of my favourite. I've already told you about the cheapest lipstick I've ever bought and one of the best I've used (link here), few weeks ago I shared with you my all time favourite lipstick by Kate Moss (link here) and today I am talking about this great matte lipstick by the American brand NYX. So, I have six colours from this lipsticks and I feel like I want more. They just have some great colours and as well the brand does offers like Buy 1 Get 1 Free literally all the time. I am not quite sure about the exact price because I bought them long time ago but I think it costs around 30 something dirhams, maximum 40. 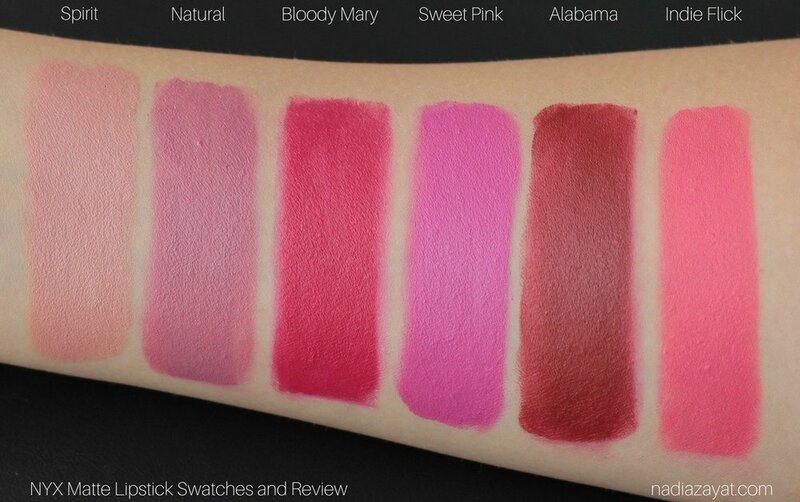 On the picture above I am wearing Sweet Pink and below this text there're swatches of all the colours that I have. I think only 'Spirit' is a little bit light for me but all the others are simply gorgeous. The texture is nice as well and doesn't dry the lips at all. The only thing I don't like is that sometimes you will need to apply few layers because it doesn't look smooth from one application. I bought mine from a store called Lifestyle in Dubai Mall, but recently NYX opened their first store in UAE, I think it's in Abu Dhabi, so maybe you would like to check it out.